Top 20: Most Popular Traditional Turkish Desserts | Do You Know Turkey | Turkish Tv Series & Drama, Turkish celebrities, travel information about Turkey and Turkish cusine. Desserts are the showcase of Turkish cuisine. Turkish cuisine is has a very wide range of desserts from puddings to sophisticated phyllo dough works even with meat, yes literally! The variety of Turkish desserts comes from cultural exchanges and historical heritage from ancient civilizations. We have prepared a list of the best desserts of Turkish cuisine. This traditional desserts selected by their popularity and taste. Lokma is a street type desserts. Lokma means “bite” in Turkish. Its size is about a chestnut. Lokma is a piece of dough fried in oil and flavored with honey, sugar syrup, or cinnamon. Lokma is a part of a tradition in Turkey “lokma döktürmek”, it’s basically preparing lokma, cooking and serving in your hood for charity. If you had a wish come true to celebrate, or if you lost someone and do charity for memory of the decadent you may distrubite lokma. This little sweets had a crunchy surface outside covered with lemon flavoured syrup and has a soft center. If you see a lokma distribution in somewhere do not miss it. People will be glad if you get their lokma. Şambali is another street dessert despite of lokma, Şambali is sold by street confectioners. It is actually not an original Turkish dessert, it is tought that Şambali is originated from Syria. Damascus -in Turkish Şam (Damascus) gives its name to Şambali& Şam Tatlısı. Şambali is a semolina cake very similar to Revani, but milk or yogurt and molasses are used as ingredients. The key point of Şambali is the peanut coverage. It is also served with kaymak (cream – glissade), the seller divides the şambali into two pieces and places kaymak inside, this sweet sandwich is a real energy boom, and you will refuel your energy. If you get tired during walking, get a Şambali and enjoy the rest of your tour. Halka Tatlısı is a very original street dessert. It’s like churros covered with sweet sherbet. Its cheap and can be found in every main street, avenue. However its popularity was not about its taste, it’s the name, Halka Tatlısı is also called Kerhane Tatlısı which means “Brothel dessert”. The name will give you the idea that it is sold in brothels, yes! But it is not the only dessert sold in the brothels, but Halka Tatlısı is in the best shape to eat by hand without any need to a fork or stick, and people have it to regain the loss energy or blood sugar. You can definitely have a Halka Tatlısı, and be cool its sold everywhere now, don’t be ashamed, you can also have fun with your Turkish friends by buying them some Halka Tatlısı. is a Turkish bread pudding dessert. It is usually served with kaymak, a kind of clotted cream. This version of bread pudding that is served with kaymak, a type of sweetened cream; this dessert provides a thick and sweet finish after a traditional Turkish dinner. Maras Ice Cream is a traditional ice cream and has been made since 16th century. Its has a dense taste than gelato and its form is hard but elastic ice cream. It is made from goat milk, sugar and powder from the tubers of wild orchids (“Dactylorhiza Osmanica”) which the Turks call “Osmaniye orkidesi.” These oval tubers grow in pairs. The best ones dry to the colour of alabaster, indicating a high mucilage content. The tubers are dried, then ground into a whitish powder called “salep” which is used in the ice cream. It is made in different flavours such as vanilla, red currant, peach, pistachio, etc. When you are walking through the famous streets you may see Maraş Ice Cream sellers. The sellers believe that playing some tricks and games with the client will enjoy the client and they will be happy,. They usually fake the delivery then ring the bell to surprise you and make you try again, many people enjoy it but some gets angry. This is a unique and delicious dessert that is fun to eat and fun to make! Dried fruits and walnuts are laced on a string and dipped in thick, unsweetened grape must (the squished grape juice that still includes skins and pulp). These strings are then left to dry in the sun. They often look like candles or a sausage due to the grape must’s opaque finish. This traditional Turkish dessert is called ‘şekerpare’ (shek-EYR’ par-EH’), which means “a piece of sweetness.” Try some and you’ll see why it’s exactly that. These sweet, sticky and tender cookies are made from semolina, flour and powdered sugar that are baked golden brown and left to steep in sweet, lemony syrup. The more syrup they soak up, the better. They should be tender enough to cut and eat with a fork. Şekerpare is made in nearly every Turkish household, sold in every bakery and sweet shop and appears on nearly every Turkish restaurant menu. It is one of the most popular Turkish sweets after baklava. Try a piece or two with your next cup of coffee or espresso. Of course, it goes perfectly with a cup of Turkish coffee, too. Blending the ingredients and kneading the dough slowly by hand is the key to making the perfect, uniform şekerpare dough that won’t crack or separate as it bakes. Each ‘pare’ or piece, should keep its perfect shape, even after soaking in syrup. Pass up the baklava for once and try this classic Turkish dessert to satisfy your next craving for super-sweet treats. It is cheaper than baklava but a good Şekerpare will satisfy you not less than the baklava. The original date for the invention of lokum is not clear. However, it is certain that Ali Muhittin Hacı Bekir’s lokums introduced the taste to the world. He opened his confectionery shop in Istanbul in 1776. An English explorer got lokum from his shop and took them to England. Turkish delight’s fame spread since then. Originally, there were three colors meaning three flavors: red – rosewater, yellow – lemon peel and green – bitter orange. With today’s rich variety of ingredients and nuts there currently are several flavors such as rose, pistachio, hazelnut, walnut, almond, coconut and almond, cream, cream with cinnamon, mint, mastic, cinnamon, ginger, clove and coffee, and fruit flavors like sour cherry, strawberry, orange, apricot, and lemon. Lokum is usually served with Turkish Coffee, but it is mostly bought as a gift to represent Turkish culture. Halva is a generic term for a few different types of dense, rich desserts; “halva” literally means “sweet”. There is a flour-based version that is more gelatinous, whereas the nut, butter, and sugar-based version crumbles more easily. Regardless of what kind of halva you find, the sweetness and nutty texture of this dessert will hit your palate just right after a Turkish meal especially after a fish plate. It is a simple yet delicious pudding cooked with crushed almonds, grated coconut, milk, sugar, rice flour and corn or potato starch. Coconut and blanched almond flakes or pistachios sprinkled on the top are the finishing touch. Like the rest of the pudding desserts it is served cold or maximum at room temperature. Turkish Semolina Halva is a fine dessert with various types, such as pistachio and ice cream. The It is generally prepared for religious feasts or days and also at the home of the deceased after a funeral, where it is served to those coming for condolence and is also distributed to the neighbors. Known by many names in various countries, this sweet cake made from semolina and soaked in syrup is a favorite among Turkish cuisine lovers. Orange flower water is often added. Chopped pistachios top this dessert for a rich finish. Have you ever wondered what to cook with quince? You know, that tough, grainy, sour fruit related to the rose? Try this classic Turkish dessert that will make quince one of your favorite ingredients. Turkish Quince dessert, or ‘ayva tatlısı’ (AI’-vah taht-LUH’-SUH’) is so sweet and tender it’s almost like eating candied fruit. The syrup makes the fruit glisten and it looks as lovely on your plate as it tastes. It’s a good dish for entertaining and it’s also served in many Turkish restaurants. Turkish candied quince easy to prepare and you can make it well beforehand. It keeps nicely in the fridge for several days. Go ahead and surprise your family and guests with this beautiful, classic Turkish dessert recipe. Are you tired of the same old pumpkin recipes? Here is a delicious recipe from Turkey that will take you way beyond pumpkin pie. Turkish candied pumpkin dessert, better known as ‘kabak tatlısı’ (kah-BAHK’ TAHT’-luh-suh), is not only simple to prepare, it’s also fancy enough for company. It’s a great way to get the full flavor of pumpkin your whole family will love, without the extra calories and carbs of pie crust. It’s perfect when you have extra pumpkin around. Be brave and try this recipe during the holidays in place of pumpkin pie and you’ll never go back. All over the world people love and eat rice pudding. It is so widespread that every country has its own preparation style. In Turkey people cook rice pudding with water, milk, rice, sugar and rice flour. In modern versions people added vanilla flavor, too. Cinnamon or grinned hazelnuts are the two main dressings. After it is browned in a salamander broiler it becomes the Turkish dessert called fırın sütlaç, or oven baked rice pudding. According to Islamic belief, when Noah survived the big flood, he made a pudding dish with the ingredients that were available. There are many variants of this Turkish dessert. Basically this is a mixture of sugar, grains like wheat, chickpea and haricot beans with dried fruits like fig, apricot and raisin as well as nuts like hazelnut, and walnut for dressing. The dessert comes with a religious custom. The first month of the Islamic calendar is Muharrem. It is a good deed to fast the first 10 days of Muharrem, and then on the 10th day, the Day of Ashure, to cook and share ashure with your neighbors and relatives. Therefore ashure has had a binding social value. Today, the tradition of sharing ashure is still very much alive. Tavuk Göğsü is an original piece of dessert in Turkish cuisine, it is “Chicken Breast” and it is dessert! You might wonder how it is turned into a dessert, but its taste is more than its ingredients. It’s basically a white pudding made from chicken—but it doesn’t taste like chicken at all. And that’s a pretty spot-on description. Tavuk Göğsü tastes more like a rice pudding, minus the rice—creamy and smooth, but thick enough to be almost chewy. It’s seasoned with cinnamon and vanilla, but there’s not even a trace of chicken flavor. The white meat is added simply for the elastic texture it creates after cooking down for a long time in milk and breaking up into indistinguishable strands. The dish has its roots in a medieval French dessert called blancmange, says Rozanes, and it was once served to the sultans living at Topkapı Palace. Though it’s still considered one of Turkey’s signature delicacies. Kazandibi is another original piece. There are two types of kazandibi: Regular Kazandibi and Chicken Breast Kazandibi. When you cook tavuk göğsü pudding on a tray with sprinkled powder sugar at the bottom, then it is called kazandibi – the bottom of the pot. The stove fire caramelizes the sugar so it colors and sweetens the thick pudding. It is scraped and served folded, hence the brownish delicious savor faces its admirers. If you leave the chicken out of the recipe, then it is called muhallebi kazandibi. This sweet and savory Levantine cheese pastry is hard to avoid in Turkey; you can smell the street vendors frying it up from blocks away. Künefe is made from a stretchy, unsalted fresh melting cheese called hatay found only in this region—mozzarella would be the closest Western analogue. The cheese is coated in sugar syrup-soaked phyllo shreds called kadayıf (the same ones used to make some varieties of baklava, as described above), and fried until crisp. Its appeal is the contrasting textures of the crunchy exterior against the soft, melty interior. It can be topped with pistachios, kaymak (clotted cream) or ice cream—or simply eaten on its own, preferably while still piping hot. Baklava, is the most famous Turkish dessert. Not much to say, but you should note that baklava is not just a single type of dessert. It has various types and our suggestion to you is to taste all of the following types and pick your favorite. When you ask a Turk what to eat as a Turkish dessert, baklava is the most common answer. Turks love sweets and baklava is a fine example of this. The description of baklava is simple: chopped nuts are spread in between the phyllo (yufka) layers, dressed with butter, baked and sweetened with syrup or honey. However, this is not a simple dessert to make. We have a whole page dedicated to this famous Turkish dessert. Basically the dessert is the same as baklava but with a slightly different syrup. The amount of water is less and milk is added. Therefore it has a whitish look and it also tastes a little less heavy. The origin of the name is vague. Nuriye is a female name. Some say the dessert takes its name after the inventor. Some say the cow that supplied milk to make the dessert was called Nuriye. Others say that after the Coup d’état in 1980, when the economy was disastrous and the prices of baklava were frozen by the municipality, people got creative not to lose money. Using milk with less sugar instead of sorbet, and hazelnuts instead of the more expensive pistachios was the invention of a baklava artisan. And he called it Sütlü Nuriye to point out the difference. Another variant of baklava, this time by its shape. A few layers of very thin phyllo dough are placed on top of each other, dressed with nuts between the layers, wrapped around a rolling-pin, and creased around the pin by pushing. It is then dressed with butter, oven baked and sweetened with the syrup. Since it has a hole in the middle you might say a portion is a little more guilt free of calories. The name comes from the circular shape of the phyllo dough containing nuts, mostly pistachios. The preparation is almost the same with burma, but the difference is that the rolls are shaped into rings and the pistachios are placed in the hallows of the rings after the dough is cooked. 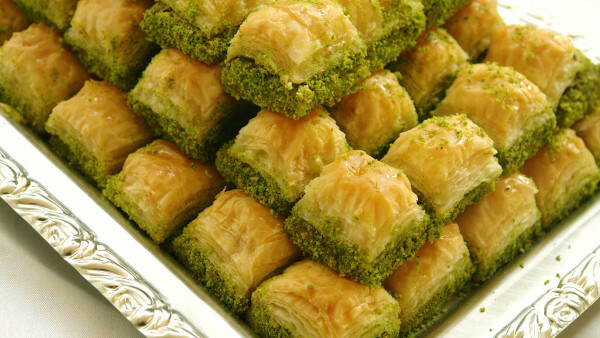 This Turkish dessert is also similar to baklava, with the exception of the excessive amount of pistachio. Fıstık means pistachio and this desert is only made with pistachios. Whereas you can get baklava with hazelnuts, walnuts or pistachio. Its hometown is the city of Gaziantep in the south-east of Turkey. I haven’t been to Gaziantep, however I have been to another city in the south-east, Kahramanmaraş. This dessert with the Maraş ice-cream on the top was a killer taste I fail to forget, ever! This is the only phyllo dough dessert with an original filling compared to the rest. A mixture of milk and semolina is boiled to a thick pudding called kaymak – cream filling. Around 10 layers of phyllo doughs are put on top of each other with a butter dressing on each, and are then cut in 7 by 7 cm squares. Kaymak and walnuts are placed on the center of the squares, folded into two as triangles, baked, sweetened with the syrup and dressed with grounded pistachios. There are all top desserts !!! No other country can claim the taste,the simplicity yet the wisdom of turning the simplest Gods given fruits to divine taste ! Yes,I would like to receive all your posts about culture,t.v. series actors and actresses especially Kivanc .Thank you. Turkeys seem to love pistachios as almost every dessert had it as either topping or main ingredient.